I went back to my mom's original carrot cake recipe and adapted it slightly to add some maple syrup. 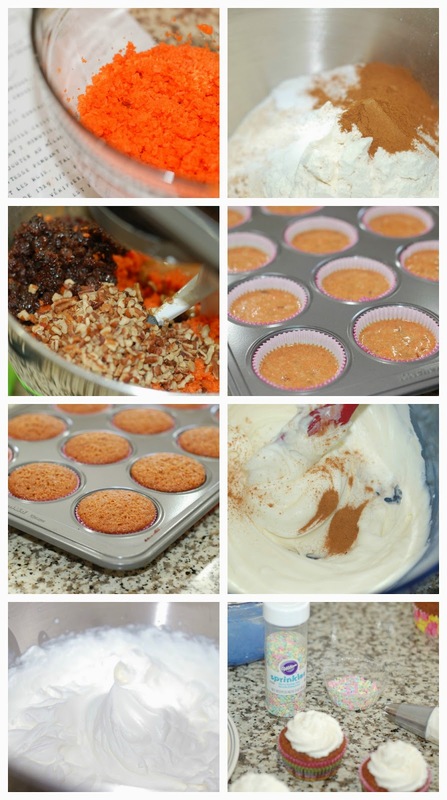 My other adaptation were these Carrot Cake Muffins. I only used baking soda in this recipe instead of baking soda and baking powder. I wanted a flatter cupcake. Also, instead of shredding my carrots, I chopped them in the food processor which resulted in a finer, minced carrot consistency and more carrot per cup. You can shred yours if you want though. Besides substituting some of the original sugar content with maple syrup, I also substituted some with brown sugar. For the frosting I just made my favorite Cinnamon Mascarpone Frosting, but you can also add a little maple syrup to it like I did for the Carrot Cake Muffins. I love it because it's so light and fluffy. I used an Ateco frosting tip #827 to decorate and Wilton Spring Mix sprinkles. The cupcake liners are Wilton also. I found them at Walmart. 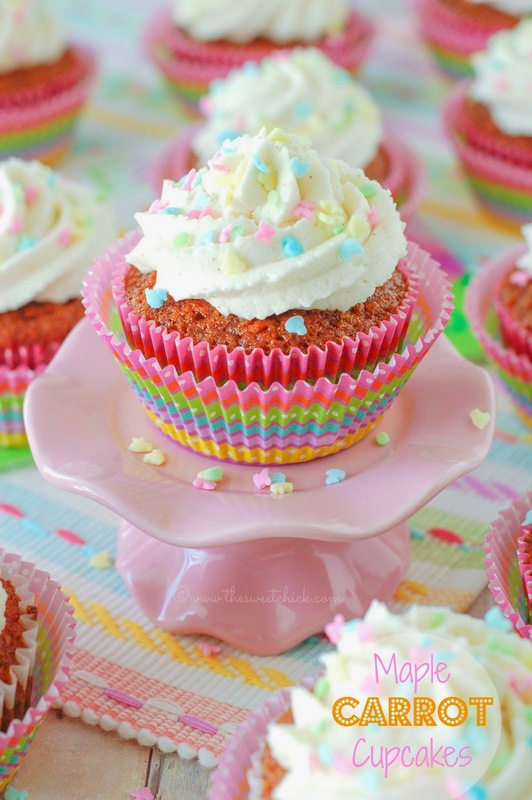 The cupcakes came out super moist and full of carrot flavor. They are not overly sweet, just the right amount. You also get some nice chunks of pecan and raisins. The frosting is a perfect compliment. I handed them all out to the neighbors and had requests for seconds. That's success! 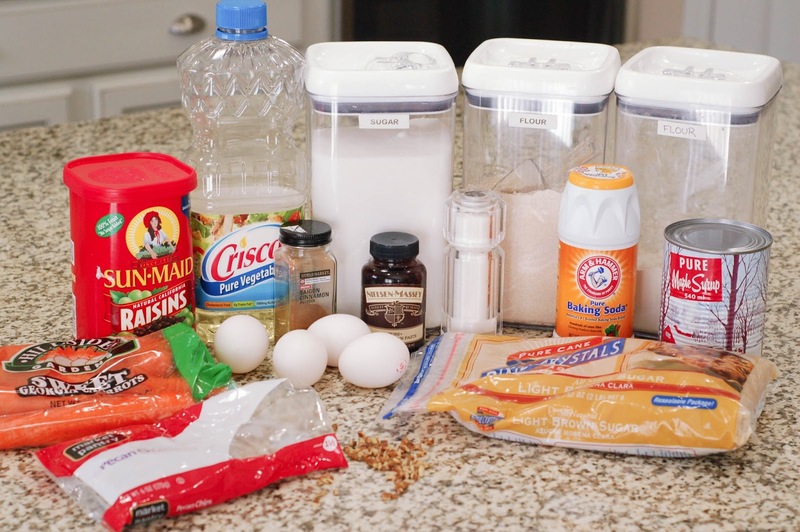 Place sugars, flours, baking soda, salt, and cinnamon in stand mixer bowl. Mix on low till well blended. Add beaten eggs, oil, maple syrup, and vanilla. Mix on low for 2 minutes. Then stop and scrape down sides. Continue mixing on low until mixture is well blended. In another bowl, stir together mascarpone, cinnamon, and confectioners' sugar until smooth. After frosting the muffins, keep them refrigerated. 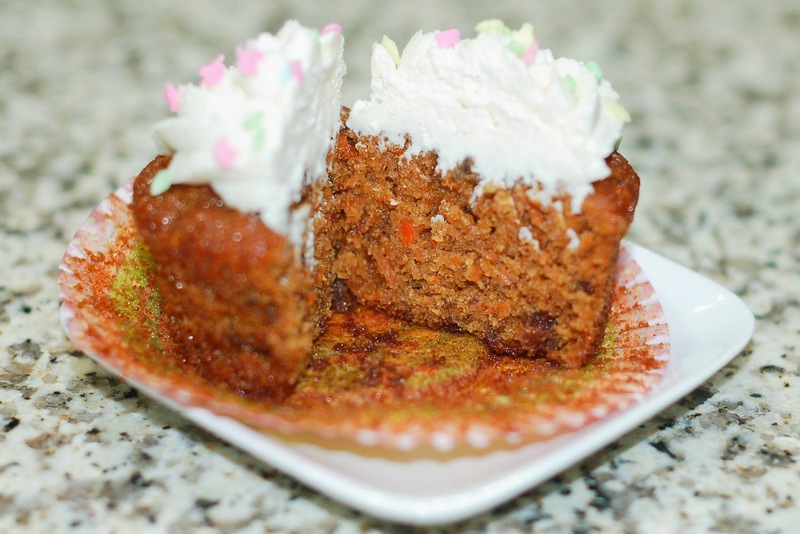 Carrot cake is my most favorite cake ever! 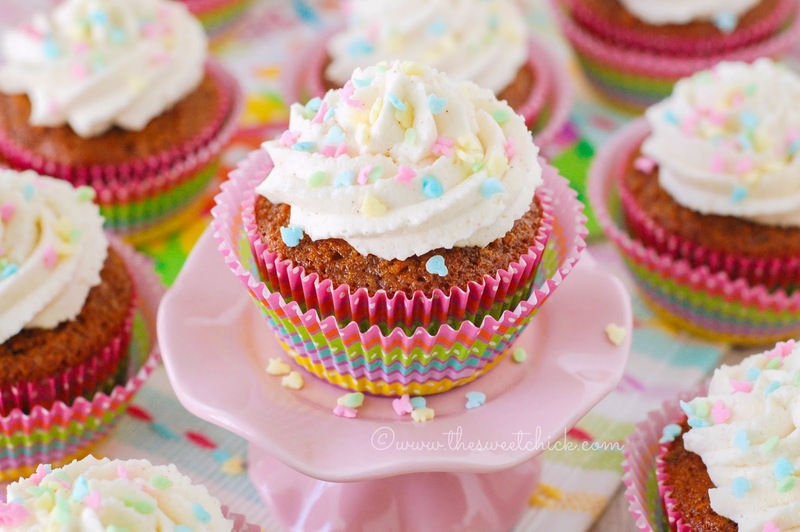 Your mini versions look fabulously moist. Oh my! Thanks for sharing at Weekend Potluck. 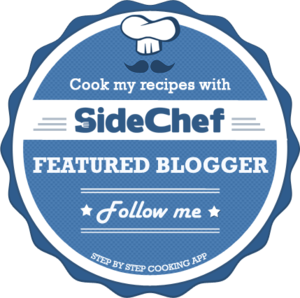 We'd love it if you'd link back to the party (it makes you eligible to be featured..and recipes like this one need attention=). Thank you Marsha. I will try my best to get that done. 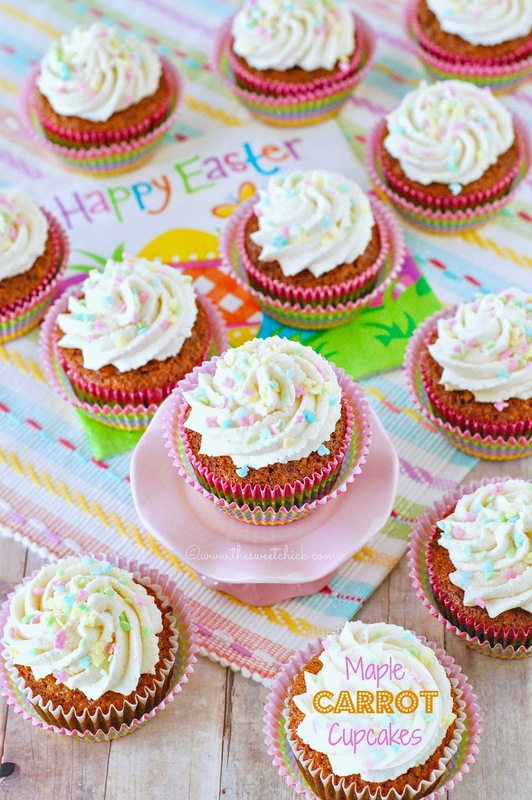 My favorite cake in the world is carrot cake and the only thing better than that is carrot cake cupcakes! These are cute and yummy looking! Thank you so much for linking up to "The Yuck Stops Here" link party. We start the party every Monday night at 8:00 pm, and we would love to see you next week!